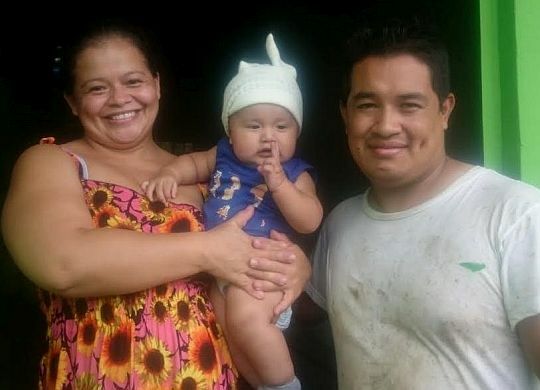 In January, The Fuller Center for Housing announced a new partnership with crowdfunding experts New Story Charity — a partnership that would begin this year with a project to move 90 families from the rural slum village of Monseñor Romero in Nuevo Cuscátlan, El Salvador, into simple, decent houses. This is New Story’s first experience with The Fuller Center’s partnership housing model in which families repay the costs of materials at zero-percent interest with no-profit made into a fund to help others in their community get the same kind of hand-up into decent homes. In this way, donors’ gifts are recycled time and time again to help families over and over. The Fuller Center and New Story have since teamed up to begin a similar project in Bolivia. The first four families to get keys to their new homes took a break during their move-in days to express their gratitude for this much-needed help in moving from an unsafe, disease-ridden, mudslide-prone area to their new homes that will have solid walls and roofs, sanitation, running water, power, septic tanks and flushing toilets — a huge improvement from the shacks on the hill.